Filed Under animal abuse rose adams beutler, animal care and control agency, animal neglect, Animal neglect by Rose Adams Beutler, corruption in the city of everett, false reporting to CPS, felony animal cruelty charges, George Beutler and Rose Adams evictions, George Beutler felonies, Hoarding, james Iles City of Everett Attorney, lori trask everett animal control, malicious prosecution, Mayor Ray Stephanson Everett Wa, poor animals, Rose Adams Beutler dog hoarding, rose adams george beutler evictions, Rose Marie Adams, rose marie adams beutler, Rose Marie Adams Moon, rose moon beutler, scam artist animal rescue, shannon delgado everett animal control, torture of animals, wasteful spending everett wa. She accuses me of being on welfare or social security, turns out she is on both. I do qualify for Social Security because of my Autism & my previous stroke but I am not on it, although I probably should be. She tells everyone about me getting my kids taken away for a couple of weeks because of a messy divorce, but doesn’t mention she lost her own kids for physically & emotionally abusing them & never got them back, didn’t even try to get them back. I am not sure who sent me these video’s but thank you! I have tried to tell people over & over that Rose Adams (Beutler) is a psycho witch but she has everyone convinced otherwise. This next videos are a mom & puppies locked in a filthy room that at first was carpeted but then the carpet gets torn out little by little, & the urine has soaked into the floorboards. The floor planks are swollen & warped with all of that urine & the puppies & mother are sleeping in their own feces. These videos happens over a period of 2 months as you watch the puppies grow it will break your heart seeing how they are forced to live. I have no idea what happened to Buster, Mojo, or Snoop, I was told that they were killed but I can see Missy, Trace, Poncho, & Sadie in this video at least. This is who she considers her dogs, so again if she treats them this way & the mom & puppies the way she does in the previous videos, I don’t even want to know how she treats her helpless foster dogs. The most brutal irony is that Poncho came from the Rene Roske puppy mill, so he went from that hellhole of a life straight to whole new kind of hell, poor little guy just can’t catch a break. She got him from Ginger Luke of Ginger’s Death Row Dogs. Poncho is the mottle colored Chihuahua, Missy is Trace’s mother & yes Rose bred Missy to Trace, I don’t know if those puppies survived or not I was told by Christine James that they did not. Missy Trace Buster Mojo & Snoop came from Karla Matilla at “Another Chance Rescue”… A hell of another chance don’t you think? I have informed her that her dogs are being treated this way so we’ll see if she will do something or not. I don’t know what area Rose is living in but when I find out I will send these to animal control in her area as well. This is White Sadie after a fight with Black & White Sadie the 2 pitbulls that 4 adults could hardly pry apart when I was staying there off & on. NOW DOES EVERYONE UNDERSTAND WHY I WOULDN’T TAKE MY DOGS ANYWHERE NEAR THIS WOMAN OR HER DOGS??? 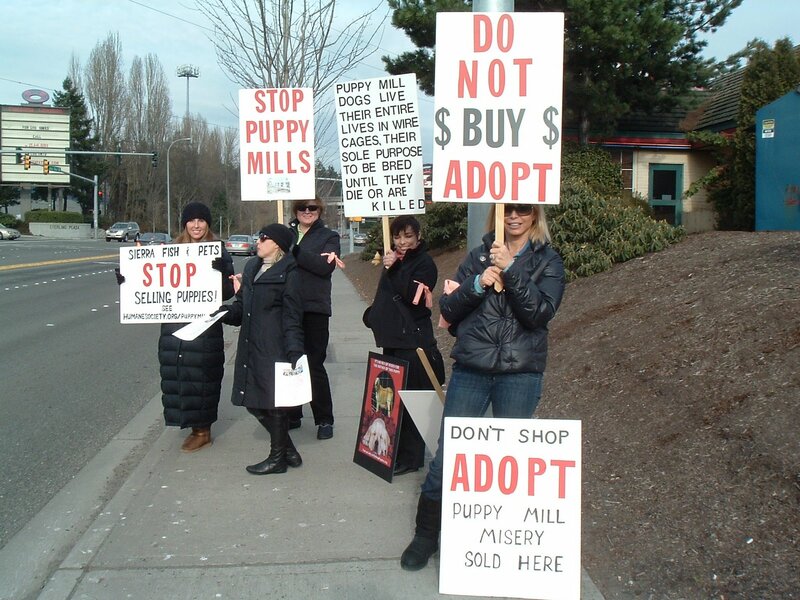 I am an experienced animal advocate and puppy mill investigator. My work is sanctioned by the HSUS, the ASPCA, BEST FRIENDS, LAST CHANCE FOR ANIMALS and CAPS, I have also worked with law enforcement on animal cruelty cases. I think it is great that those posting probably really do care about animals and we really appreciate that, we need more like you. There are several things to keep in mind… NO ONE had commented on the Sierra fish & pet story, she is talking to the other people inside her head, also what she means by she has worked with law enforcement is that she lies about people & turns them in to Everett Animal Control… Mine are NOT the only dogs she has had taken by Everett Animal Control. I am going to let these other agencies know she is saying she is sanctioned by them as well, they might be interested to know that little fact themselves. Sadly enough there is a worse video out there. I don’t know if I counted right but there is 15 dogs, plus I know she has a ton of dogs in a garage or shed either connected or behind her house. According to whomever was talking on the video. The bullie Monkey looks like he needs immediate medical attention if he is even still alive. What I can’t figure out is how after 20+ years of not paying rent they haven’t had a single eviction since February of 2011… all I can figure is they found a free place to live or are squatting somewhere. I do know she got 6 new charges out of Edmonds so I am going to go down & get copies of the incident reports, the clerk said it was about her beating the 2 pitbulls with a bat but that there was more, so I will let you know when I find out. « Rep. Derek Kilmer (D) turns a ‘blind eye’ to the fraud against Retired and/or Disabled citizens. come on people ….animal cruelty is what it is and it should be a felony. enough is enough. something needs to be done to this woman. she needs to be punished for what she has done time and again. I promis you if I were to do half the things she has done I would be sitten in jail. and that is exactly where she needs to be. ridiculous. some people and there blinded eyes. wake up and deal with the reality. Send this jerk to jail…. and never let her have another animal… as long as she lives!!! But who will tell that reality to “them? I wish someone have thatkind of anger/passion/courage!! Keith I just emailed you with my phone number. I would like to get a statement from you. I am sorry about your dealings with her, she uses the system like clothes & the system lets her continue to harm others. Here is an update on satins child rose adams i never thought i would ever be in the presence of such a methodical lyer but it was a blessing! good once againwon over evil sad part is she was so pissed one of her horns melted LOL she has set out to get signitures from people so they may perjer themselfs that devil is going to take alot of people with her for the more intellecual typesPlease read the dshs mental eval on this wicked hateful thing! My skin is about 4 inches thick and tho i still wish her wll even tho she left a message at my home today to watch my back and i know shes comming after me with all shes got rest ashured that since she brought the fight to my door that even if she gets me she has already lost because she is absolutly incapable of telling the truth my heart goes out to you rose and i do love you just not the spirit you carry may god have mercy on your torminted soul!!!!!!!!!! Did she leave the message where or with whom? Save that so she can’t continue lying. She is a slime bag beyond what you have ever encountered. Trust me, she probably makes satan “Why didn’t I think of that” seriously.